Calm down, you didn’t miss it. Dinant is not out yet. Dinant is a project in development. Dan Dolan’s the designer, Nadir Elfarra did the map and Carl Nogueira, the campaign game. 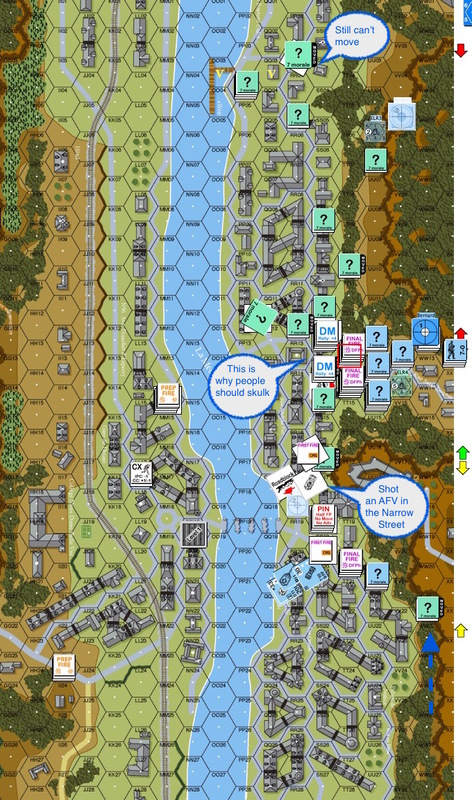 Stanley Neo and I have been playtesting the Dinant scenarios, so this perhaps one of the rare times when you see an AAR on a product not released. 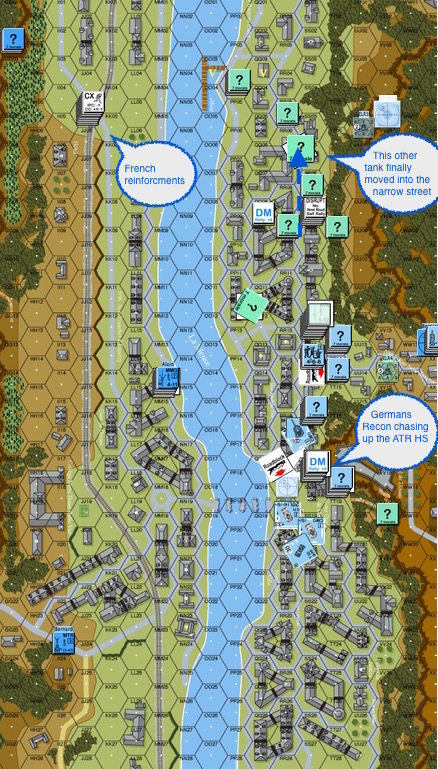 This scenario, “Chasseurs on the Meuse”, depicts an action that took place on May 13 1940. The Belgian 8th Chasseurs de Ardennais, fighting a series of delaying actions, was chased all the way up to the edge of the Meuse by Rommel’s Ghost Divison (7th Panzer). The French arrived at the west shore and did their best to help out. 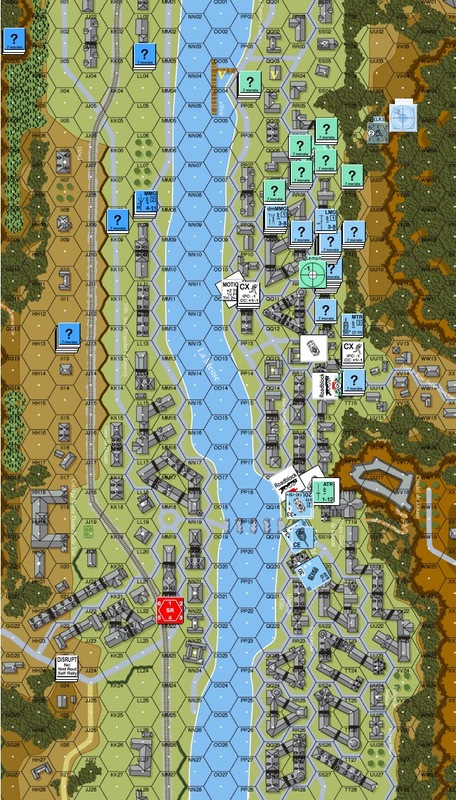 The Germans are to seize the victory locations marked on the top of this map within 7 turns. The German Recon company can choose to come in from the marked locations on the right side of the map. Their HQ and Armoured Car platoons can come in from the south (bottom of the map) as well. This was my Belgian/French setup. The three VC locations were on the top part of the map. One of the VC hexes was under the stack of Belgians to the right of the VC stone building. The Germans start with 13 elite squads, 5 leaders, 4 armoured cars and a host of motorcycles. . The Belgians fields 9 first liners and the French, 3 first liners immediately and 3 on Turn 3. 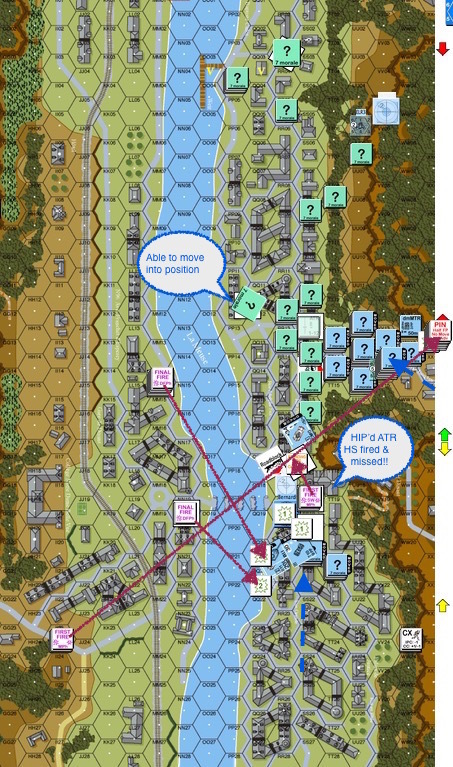 The Allies have 6 leaders, 2 self propelled guns and a module of OBA with scarce ammunition. 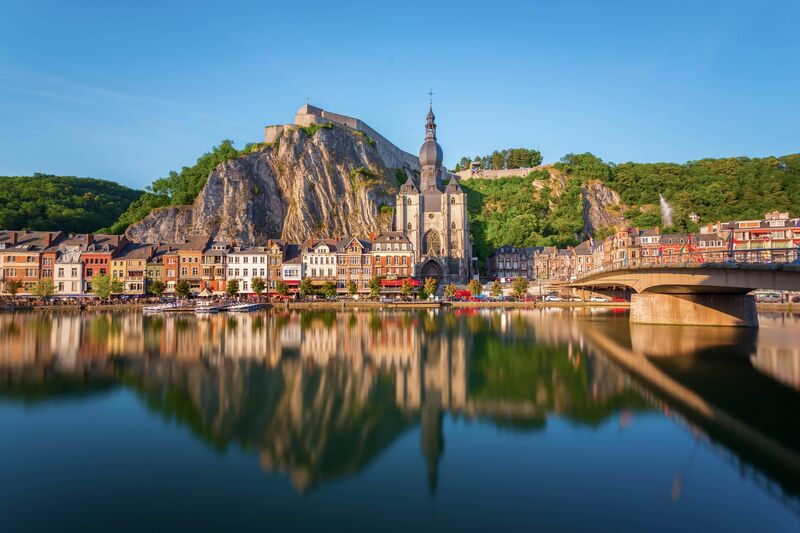 The Belgians had 2 HS HIP’d with ATRs around Rue Saint Jacques (the road through the valley from the right) and one on the first level of Notre Dame de Dinant. The big set of concealment counters in front of the roadblock at Place Reine Astrid (in front of Notre Dame de Dinant and the Citadel was a decoy to turn enemy AFVs that way. Turn 2 Germans : The German infantry decided to heap through the Rue Saint Jacques en masse. The French mortar managed however, to catch their counterparts from across the Meuse. The armoured cars got a bit of harassing fire from the French across the river. Hearing the Germans in the Plaza outside, the Belgian HS in the Notre Dame threw off their cover and went to the windows with their ATR. One entrance to the narrow streets was blocked but the other one needed to be sealed as well, best with a wreck. The first armored car passed by and was about to turn into the narrow streets to the north. The targeted AC continued to speed away and the second followed suit. The other ACs started firing into the church and the German infantry got the headsup about Notre Dame. Turn 2 Belgians : The intrepid ATR team survived the initial German fire. It now sounded like half the German army was running for the church. The Belgians went to the windows again and fired. This time wrecking the 2nd armored car and therefore successfully blocked the armoured car platoon from the action to the north! In the north, the Belgians were nervous about all the Germans coming down the valley but they felt a little too smug about lying concealed in stone buildings. They decided not to skulk. Big mistake. The Belgians in the first 2 building hexes got blown away by the massed German firepower. While one of the Belgian self propelled guns moved into place. The one to the north refused to budge without their partner and a radio to contact them with. Turn 3 Germans : The Belgians to the north were simply not retreating fast enough. The Germans caught them in 3 locations where Close Combat killed 2 Belgian squads. Turn 3 Belgians : Hey! The French reinforcement arrived, together with a radio to call down the artillery. Yes, ammunition was scare but it’s something. Given the rowhouse configuration, the French could only look for line of sights through the gaps they could find. The other Belgian self propelled gun was touched by the change in sentiment and moved into one of the narrow streets to cover the German advance. 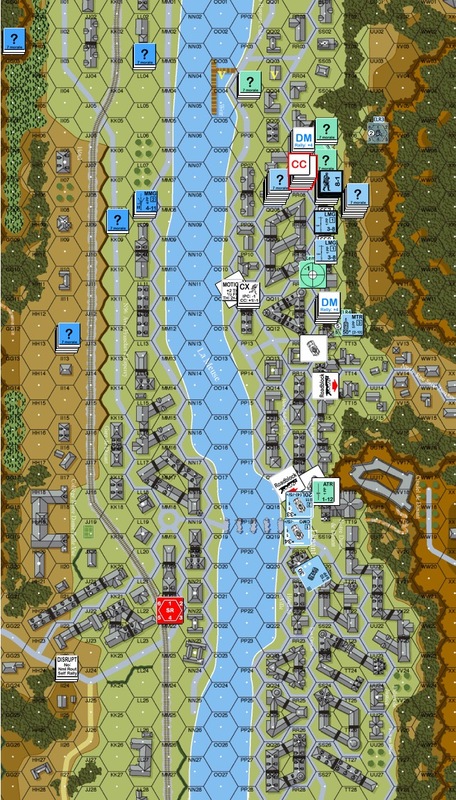 Turn 5 Germans : The Belgians finally got the hang of just how far to move back and how to shoot the Germans in bypass. The Belgian SPG closer to the river was shooting at the Germans moving through the little plaza. When it Firist Fired, the lead German AC moved forward, turned and faced it. The other HIP’d HS ATR team who sat through the Close Combat downstairs sprung out of hiding. They shot and killed the lead AC! A Close Up shot of how the lead German AC was killed by a HIP’ed Belgian ATS HS. 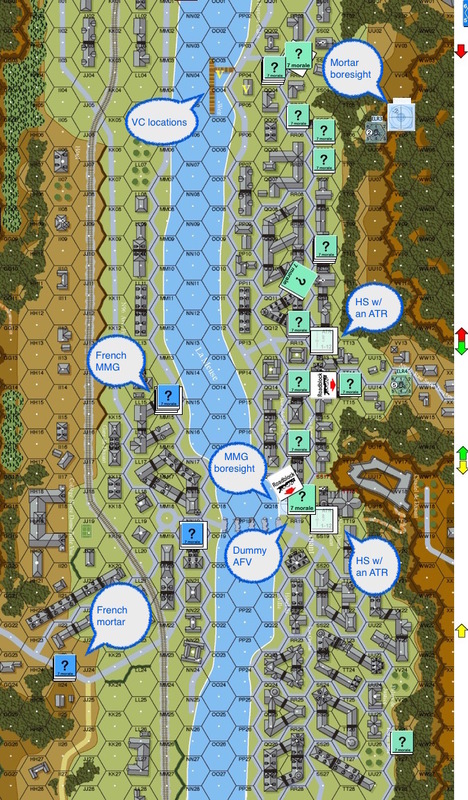 Turn 6 Germans : The Belgians continued to back off just enough to shoot at the Germans in bypass. The French OBA was of no help whatsoever. By the time they got a response from obliging French gunners their radio went dead. Our second Belgian ATR HS managed to run away though! The Germans, running out of the time, got even more aggressive and jumped onto a concealed Belgian stack. The Belgians chose NOT to unconceal and NOT to fight. 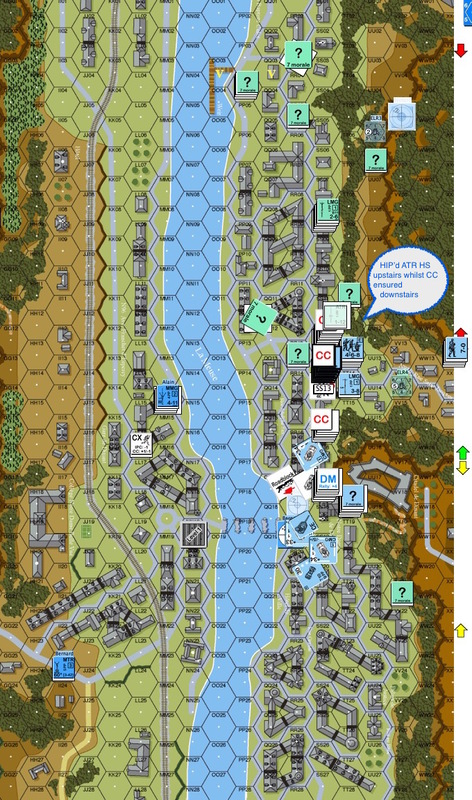 To the German’s disappointment, Belgians survived the German attack and retained the option of moving away in the next Belgian turn, blocking the Germans for another round. Seeing the distance between themselves and the VC building, the Germans decided that they won’t be able to make it to the VC objectives in time. Overall : I think the long lines of rowhouses presented an interesting problem. The Belgians had to be far enough to not invite close combat given the German superiority in numbers and to not be shot in their retreat. However they needed to be close enough to in turn shoot the Germans in bypass. This is especially important when they do not have enough firepower to take the Germans inside the stone buildings. The mass of Germans was unnerving but had some of the Germans came in further to the north and down the cliffs, they would have been a handful. Trying to get the French to help from across the Meuse is a problem as well. Finding gaps between buildings though you can shoot was tough. The OBA was practically useless in my game. Thoughts from Stanley Neo : I packed the Germans’ entries via the XX13-XX16 while 3 choices were given. After some thoughts, I should have spread the force into two groups, one taking the top XX03-XX13 and the other remaining in XX13-XX16 to put more pressure on the Allies that is on the same side. At least some Germans would then be able to attempt to climb down and do a flank from the North. Germans on the East were stuck around the entry zone for too long and should have pushed more aggressively. LoS study of the terrain may eliminate issues of troops getting pinned or broken by Mortar fire from the West. 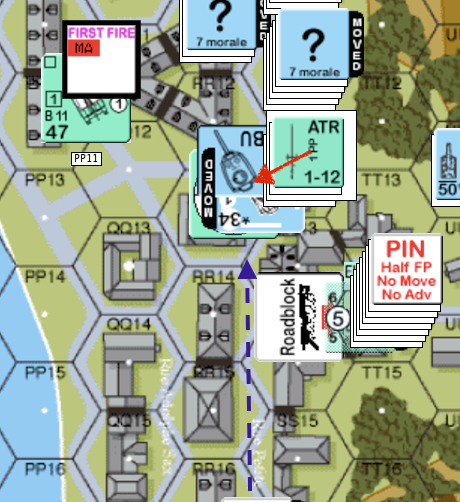 The roadblocks were wisely placed at a chockpoint around QQ17/RR17 with ATR. This effectively blocked out the rest of the German’s AFV support making it harder for the Germans coming from the East to push. Overall the scenario is relatively great to play. Would be interesting to replay the scenario with the afterthoughts built into the attack plan. What are your thoughts with regards to this module? Are you looking forward to it? 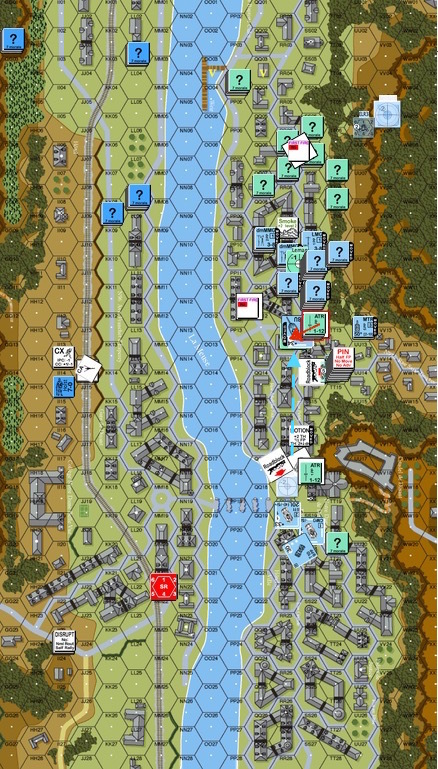 This entry was posted in Game Play, Products and tagged AAR, Advanced Squad Leader, ASL, board wargame, Dinant, ETO, Hong Kong, Playtest, wargame. Bookmark the permalink. Will the croix de guerre module be required to play this? If so theres going to be a lot of people who wont be able to play it including me. French counters are needed, so CdG is needed, so yes. However, this is not immediately available so who’s to say we won’t have CdG by then? Remember also that you only need one module between yourself and your opponent. Plus VASL is always an option! Great AAR. Thanks for working on a new module; can’t wait. Other than the change in how the Germans should have approached, how does each side rate the “balance” of the scenario? Other questions. How is this map used in the CG? How much more map has yet to be revealed? What is the CG’s overall action depicting? We will know more about the balance as other playtesters with different levels of experiences give their interpretation and evaluation. The Germans have the people and firepower but they are also the ones who need to navigate through the rowhouses which presents an interesting challenge. The restricted terrain forces you to think harder about where you can fire. The need to bypass forces you to focus on how you can move through on time against -2 shots. The map is huge and gorgeous. This is about 1/8 of the map. Since this is in development stage I am not at liberty to disclose more details than I am allowed to. Know however that the CG is done and playtesting is underway. I like early war so would be interested, considering the numbers that scenario might need one of the ‘first two chits drawn are black’ or a pre-reg hex..
Hey Joss! I am certainly having fun playtesting these scenarios. We are about to start on a rather unique night scenario next. Will keep everyone posted! !